What you are about to read is a verbatim re-typing of my contribution to the Four Corners: Regional Retail Advisor Reports article in Scrye Magazine #1, from June of 1994 (although I’d have written this sometime in early May). I’d have changed names to protect the innocent but the only name is mine and I’m far from innocent in this event. I’ve made every effort to maintain formatting but have added hyperlinks (which didn’t exist back then and besides, this was a print magazine). While typing this into this post I noticed LOTS of grammatical errors, primarily involving extra commas. Feel free to comment in any way but bear in mind that I’ve matured a bit since then. Also of note is that I include our store information as it was then and so most of this information has changed (including that they have our phone number dead wrong). Help! My Colossus of Sardia is napping in the begonias! Hello from Kalamazoo, Michigan. The latest news here on Collectible Card Games is that there is still only one: Magic: The Gathering. This will not likely be the case when next I write. However, for now, Magic is the only game in town. Ultimately, I would not be upset if it were always the only game of its type, but it is apparent that a virtual flood is coming and so, since variety if the spice of life, I will be there watching and playing all of them. Actually, there does not seem to be much of a Collector’s market in Michigan. From all of the people I have talked to, even as far away as Ann Arbor and Traverse City, very few people here seem to be buying the cards for purely collectible purposes. We do have a dozen or so customers who put sets together, but they are the exception, not the rule. If the card is not worth playing with, it does not sell well as a single and it does not matter whether it is an Alpha, Beta or whatever. We seem to have a strong Player’s Market… Pure and simple. For this reason, my store has put all of the Alpha run away. Unless someone ask for them specifically, they are not out for sale. This move was made in the anticipation that eventually the Alphas will become a treasure, even here, and when that happens we want to have something to offer. The selection, when I compare it to the quickly depleted selection in our Revised Singles, is still quite good. Hopefully we will eventually gain some collectors, but for now I am willing to be patient. My store has sold Sports Cards for years, in packs and as singles. When Magic was released, it was an easy step to sell singles of these as well. We have had singles available for Magic for as long as we have been selling the packs. In fact, there were times when singles were all we had. I am happy to say that this is not the case any longer. We keep a binder with nine-pocket pages numbered to keep track of the singles on our price list. We only keep up to five of any card in a pocket, at any time. I place the extras aside. I then take all of these excess cards and make up Spell Packs. They usually contain between 12 and 24 spells, with no duplication in any pack. 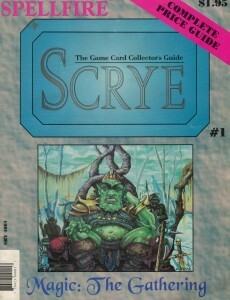 The packs are usually common cards, but there are occasionally uncommon cards mixed in. The price per card usually works out to be between 10 and 20 cents. These Spell Packs sell really well for us and keep us from having to keep track of back-up for the singles binder. The extra Land cards are treated in the same way, but are not a random selection. I bundle them either as ten of the same type of Land, or as two each of the five types of Land. I sell these for $1.75, at a steady pace. At the time of writing this article, the Fanfare Magic League has met twice. On each occasion, the event (which is held on Sunday) has drummed up much interest in the game. It is easy to see that twenty people, all crammed into the front of the store and all playing the same game, might turn some heads. We have nine teams of three players each, in the League. Each player must play doubles against each team twice. We are going to be awarding trophies for the top finishers and expect the league to last most of the way through Summer. The store team, Terror Inc., is currently in Second Place (although we are ineligible for the prizes) and I am ranked Seventh. I am excited about the arrival of Legends and look forward to writing about all of the amazing developments. See you in Issue #2.